Enabling SSO for LinkedIn lets your users sign into your Portal using their LinkedIn Profile. Once they do so, their basic profile information will be pulled through to your Portal and into your Operate Backend, where a contact will be automatically created, containing the user's details. You will find the contact under Member > Contacts. NOTE: The email address that belongs to the member's LinkedIn account, must be the email address in your Operate contact record in order for the SSO to work. If the member exists as a contact in your system, their contact email address must be updated in order for them to be able to log into the Portal using LinkedIn. Click on My Apps and sign in with your LinkedIn (or Company LinkedIn) account credentials. In Operate, go to Settings > General > Portal > OperatePortal and paste the Client ID in the LinkedIn API field. Tick to allow users to sign in with LinkedIn. Return to your saved App in LinkedIn and under Authentication, in the left hand menu, tick r_basicprofile and r_emailaddress in the Default Application Permissions section. 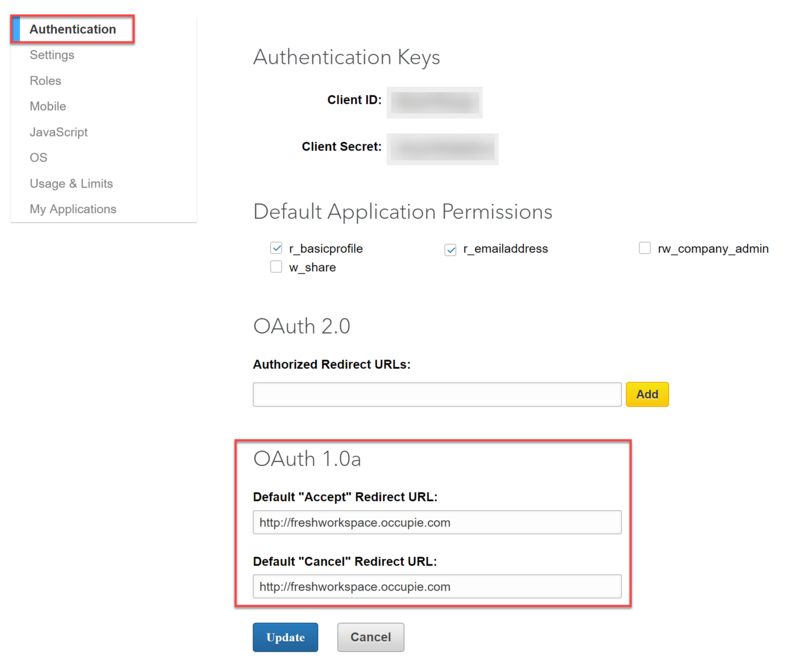 In OAuth 1.0a, enter your Portal login page URL, both for the Accept and Cancel Redirect URLs. Your Portal Members can now sign in with LinkedIn. Your LinkedIn and your Portal registered email addresses must match or sign in will not work. NOTE: If you update any of these areas in LinkedIn after the first time you sign in to the Portal, they will not be updated in your Portal profile the next time you use it to sign in.